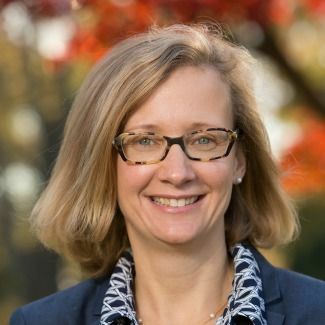 Kirsten Prettyman Adams ’91 earned a degree in Environmental and Evolutionary Biology from Dartmouth College; while there, she was also named a Presidential Scholar. Adams went on Yale University to earn a master’s degree in Environmental Studies. Inspired by her Bryn Mawr experience, Adams became a teacher, then moved into administration. She served as the Head of Upper School at both the Hockaday School in Texas and McDonogh School in Maryland before becoming Head of School at St. Stephen’s & St. Agnes School in Virginia. I always knew that I wanted to work in education because of the energy and enthusiasm students have. My first real teaching experience came during my senior project with the Chesapeake Bay Foundation, which led to an internship. I credit these experiences with my choice to become a teacher. To me, there is nothing more joyful than watching a child grow into his or her best self. I also love the sense of community and commitment in schools. The relationships that develop between the adults in an independent school community are extraordinary, and I love being surrounded by people who love their jobs. When I started teaching, I had visions of retiring after 40 years of teaching biology—I wanted to be like Betty Thompson, my biology teacher at Bryn Mawr. However, I had an amazing mentor who encouraged me to take the step into administration. The biggest challenge in my job now is time—there are so many competing priorities, and I have to be very intentional about how I spend my time. I wish I could spend more time visiting classrooms and seeing teachers working their magic. I love that Bryn Mawr taught us how to think as opposed to what to think. We were encouraged to develop our own perspectives by doing good research and having authentic conversations with our peers and our teachers. We also received tremendous support from our teachers. I knew I was not only allowed, but also encouraged, to take risks in the classroom, on the athletic fields and in all aspects of life, and I knew that there were teachers who were there to catch me. They held us to very high expectations, and we wanted to meet those expectations because they cared about us so deeply. Athletics were a huge part of my connection to Bryn Mawr. I developed relationships with my coaches and my teammates that endure to this day. The two most powerful things I learned from athletics at Bryn Mawr were how to get along with people and work as a team, and how to take criticism and use it to get better. We learned how to balance leading and listening, and that leadership is often more about listening than anything else. This ability to collaborate is critical for success in most professional endeavors, and I am indebted to Bryn Mawr for prioritizing these skills. Today, I use these same skills to help members of our community pursue their ideas.